I AM LOOKING TO FIND OUT ANY INFORMATION ON A VERY OLD NEW HAVEN VERY FANCY WALL CLOCK THAT I RECENTLY PURCHASED. THE CLOCK CAME OUT OF A VERY OLD TEXAS ESTATE. THE CLOCK IS ROSEWOOD, WITH VERY INTRICATE FANCY WOOD INLAYS CONSISTING OF HOLLY, BUTTERNUT, WALNUT AND EBONY. THE CARVINGS ON THE CLOCK ARE ROSEWOOD. THE CLOCK LOOKS TO BE COMPLETELY ORIGINAL, WHICH IS ALMOST UNHEARD OF TODAY FOR A CLOCK THIS OLD, BUT BEING A VERY LONG TIME CLOCK COLLECTOR AND RESTORER, I KNOW ORIGINAL WHEN I SEE IT. THE FACE IS ACTUALLY MADE OF STEEL, AND IS HAND PAINTED AND A BIT OVER 12 INCHES. THE ENTIRE FACE AND SURROUND ARE 'PEGGED' TO THE CLOCK CASE, SO IN ORDER TO REMOVE THE FACE, YOU SIMPLY REMOVE THE HANDS, AND PULL THE DOWEL PINS (TWO ON ONE SIDE, ONE ON THE OTHER) AND THE ENTIRE FACE UNIT COMES OFF, REVEALING THE WORKS. THE WORKS TOO ARE ORIGINAL, STAMPED WITH THE NEW HAVEN MARKINGS, AND MOUNTED TO THE BACK OF THE CASE WITH THE ORIGINAL UPPER AND LOWER WOOD BLOCKS. THERE ARE NO EXTRA HOLES ANYWHERE ON THIS CLOCK. THE CHIME STRIKES ON THE ORIGINAL LARGE BELL (LOOKS LIKE AN ENLARGED VERSION OF THE ALARM BELLS YOU NORMALLY SEE ON SOME MANTLE CLOCKS) WHICH SOUNDS LIKE THE OLD BELLS ONCE USED AT THE COUNTERS OF OLD HOTELS. THE BELL IS STRUCK BY A LEAD ROUND FLAT HAMMER. THE CLOCK STRIKES OUT THE HOUR ONLY, NO HALF HOUR STRIKE. THE PENDULUM BOB IS VERY ORNATE, AND THE DOOR YOU SEE THE PENDULUM THRU OPENS UPWARDS. 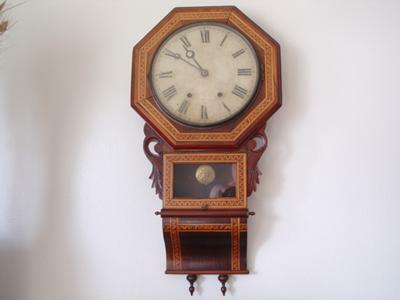 I HAVE CLEANED, OILED AND ADJUSTED THE WORKS AND THE CLOCK RUNS BEAUTIFULLY AND KEEPS NEAR PERFECT TIME. I DON'T BELIEVE THE CLOCK HAD BEEN RUNNING FOR AT LEAST 40 OR 50 YEARS PRIOR TO ME GETTING IT GOING AGAIN. I WOULD LIKE TO KNOW FROM APPROX WHAT YEAR THIS CLOCK DATES TO, AS WELL AS IT'S VALUE. I KNOW THAT NEW HAVEN MADE SOME VERY ORNATE ALMOST CUSTOM CLOCKS LIKE THIS IN THEIR EARLY YEARS, AND I HAVE SEEN A PHOTO ONCE OF A SIMILAR NEW HAVEN CLOCK, WITH FANCY INLAY WORK AND THE SAME FANCY PENDULUM BOB AND THE PENDULUM GLASS THAT OPENED UP IN THE SAME WAY. MY GUESS IS THAT THIS CLOCK IS VERY RARE AND MOST LIKELY ONE OF A SMALL NUMBER MADE. THIS CLOCK IS VERY OVER THE TOP AND EXCEPTIONALLY BEAUTIFUL IN PERSON. ANY INFO WOULD BE APPRECIATED. THANK YOU.